This week’s topic is parent/teacher conferences; this blog post originally ran in November 2016. Its information will help you prepare for what you’ll learn at our upcoming Green Room, Pre-K, and Junior K conferences on November 5th and 6th, as well as the Creche/Red Room conferences on December 3rd and 4th. Enjoy! Creche students at 45th Street experiment with apples via stamping. 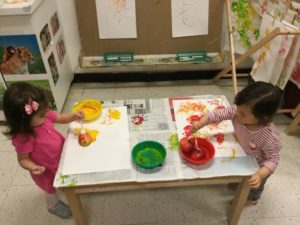 They are also engaging in a sensory experience by touching the paint, strengthening fine motor skills by grasping the handles of the stampers, while increasing their social skills by working together at the art table. Learning math skills is fun and educational! 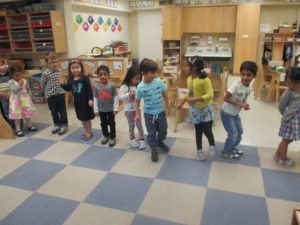 Junior Kindergarten children play a game where they ultimately create a boy-girl (AB) pattern. The idea of learning through play is a key principle here at The International Preschools. Our school mission states in part that “through play, we promote the cognitive, emotional, social and physical growth of each child in a nurturing atmosphere.” It is believed that, through this practice, children will learn the necessary social and cognitive skills that they will use throughout their lives. How, you might ask, can these goals be accomplished? Exploring our “flags” (the countries that we are from) is an important activity during our “All About Me” unit. 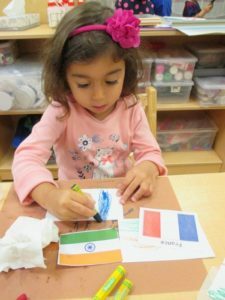 At The International Preschools, a different theme is assigned to every month of the school year. Teachers incorporate this theme into every classroom center, from the sensory table to the discovery center to the songs that are sung and books that are read.